China's Chang'e-2 probe took multiple images of the asteroid Toutatis during its Dec. 13 flyby. China's official news agency is reporting that the country's Chang'e 2 deep-space probe made an amazing flyby of the asteroid Toutatis this week, snapping a series of pictures as it passed by at a distance of just 2 miles. The achievement signals China's entry into yet another exclusive space club. 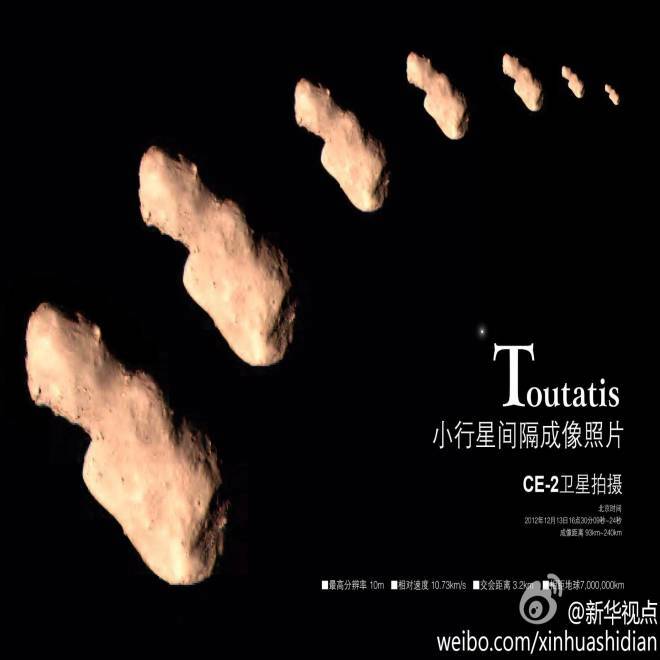 Only four of the world's space efforts have managed close encounters with asteroids: NASA (with NEAR Shoemaker and Dawn, for example), the European Space Agency (with Rosetta), Japan (with Hayabusa) — and now China with Toutatis. The official Xinhua news agency quoted officials at the State Administration of Science, Technology and Industry for National Defense, or SASTIND, as saying that Chang'e 2 buzzed past the 3-mile-long (5-kilometer-long) asteroid at a relative speed of 24,000 mph (10.73 kilometers per second). Chang'e 2 was launched in 2010 primarily to serve as a lunar orbiter, but after a successful mission at the moon, the $132 million spacecraft was repurposed as a deep-space explorer. The encounter with Toutatis had been planned for months, but Chinese media kept mum about the results until Saturday. Aficionados of planetary science hailed China's success. "Oh my goodness, did they succeed. This is awesome," the Planetary Society's Emily Lakdawalla said in a blog post passing along the news. On the Unmanned Spaceflight discussion forum, Ted Stryk wrote, "Welcome to the interplanetary club, China." Toutatis is a near-Earth object that's big enough to cause a mass extinction if it were to hit our planet — but fortunately, it isn't projected to come all that near in the foreseeable future. This week it passed by Earth at a minimum distance of 4.3 million miles (7 million kilometers). That provided scientists with an opportunity to study the peanut-shaped space mountain at a relatively close but totally safe distance. NASA's Jet Propulsion Laboratory conducted a series of radar observations using the Goldstone radio antenna in California, and on Friday, JPL released a grainy time-lapse video showing Toutatis' rotation. This video, generated from Goldstone's Solar System Radar, shows the rotation of the asteroid when it was 4.3 million miles from Earth. The insights gleaned from such observations could conceivably help scientists figure out how asteroids came into existence early in the solar system's history, how to mine asteroids for valuable resources, or how to divert asteroids that have the potential to threaten Earth. Lakdawalla noted that the radar readings, combined with China's up-close images, made Toutatis one of the "best-studied asteroids in the solar system." That sounds like a bold statement, considering that NASA studied the asteroid Eros with NEAR Shoemaker for more than a year, and had Dawn in orbit around the asteroid Vesta for a year as well. But the fact that Toutatis has gotten so much attention in the past week from multiple space efforts certainly suggests that scientists see "minor planets" as a major interest. Still more asteroid encounters are on the agenda in coming years — including Dawn's arrival at the dwarf planet Ceres in 2015, a potential sequel to Japan's Hayabusa mission, and the crewed mission that NASA wants to send to a near-Earth asteroid in the mid-2020s. And let's not forget China. Chang'e 2 isn't finished just yet. Xinhua quoted sources as saying that the probe "is continuing its deep space travel and will reach a distance of more than 10 million kilometers away from Earth in January next year."